Hours after it was reported that Los Angeles Lakers forward Brandon Ingram would likely miss the rest of the season, it looks like the team won’t be able to count on the return of Lonzo Ball either. The team has shut down Ball for the remainder of the season after doctors re-evaluated the guard’s left ankle, per Shams Charania of The Athletic. Yahoo Sports’ Chris Haynes had previously reported that there was a “strong suspicion” this would be the outcome of Ball’s examination. Ball has been out since Jan. 19 with a left ankle injury. He was previously given a four-to-six week window to return, but that target date has been pushed back repeatedly. Now, it has been pushed past the end of the season. It’s hard to imagine how this season could get much worse for the Lakers. The playoffs were a clear goal for a team that boasted both LeBron James and a respectable collection of young talent, and now they’re 11th in the Western Conference 6.5 games out of a playoff spot with 17 games left to play. The team was in dire need of a winning streak to stay in contention last week, and it has now lost four games in a row. Ball and Ingram won’t be on the floor again this year and James is on a minutes restriction. There are only so many ways a white flag can be waved. Now, all there is left to do is tank for a better draft lottery position this offseason. 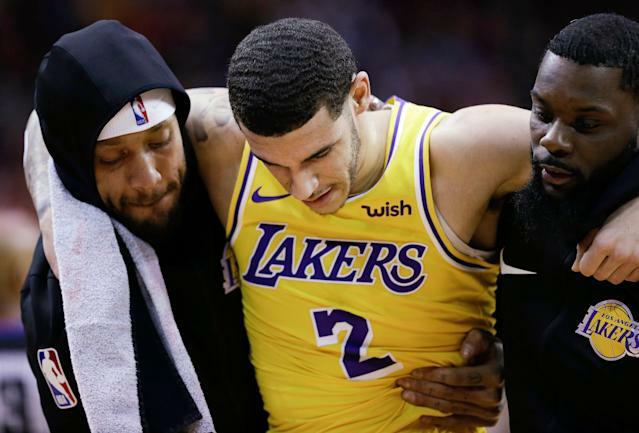 The loss of James to a groin strain for 17 games is widely considered the turning point for the Lakers’ disappointing season, but it’s arguable losing Ball was why the team was completely unable to make up ground once James returned. Ball wasn’t quite a star in the stats department this season for the Lakers, averaging 9.9 points, 5.4 assists and 5.4 rebounds per game while shooting .406 from the field, but his size and versatility on defense was huge for a Lakers team that ranked in the bottom 10 of points allowed per game this season. Without Ball, the Lakers were left to start Rajon Rondo at point guard and never really jelled, even with James running the show once he came back. With Ball’s year gone, it remains an open question if he will even be a Laker next year, as the team does everything it can to add another superstar or two to play alongside James.